As you can see from the map, this is county living. Most homes have acreage, farm land, vineyards, orchards, crops, are horse properties, or just have space to enjoy without being so close to your neighbors. Most of this area, east of Hwy 99 and east of the diverting canal, is in the Linden Unified School District. 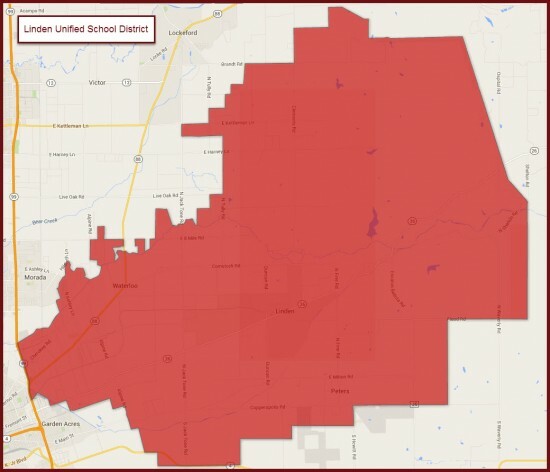 See the below School District Map. Are you curious about the Average Price per Sq. Ft for homes sold in Stockton 95215? See the Market Trend Report for Stockton 95215 shown below. This report is updated monthly. For a little bit “About Us”…Bob Peralta was born and raised in the Linden area, so he knows this area well. Offering 27 years of professional representation, Bob Peralta and Bob Peralta Properties are dedicated to making the complicated process of buying or selling real estate as simple, easy and stress free as possible. Our ratings from independent 3rd parties such as the Better Business Bureau, Yelp, and Zillow are your assurance that we provide accurate market knowledge, professional service and advice in a timely manner. Our goal is to provide our clients with service that exceeds their expectations. A graduate of the University of the Pacific School of Business with a Bachelor of Science degree in Business Marketing, Bob Peralta is the Founder and Managing Broker of Record. Please check out the MLS listings of the homes for sale Stockton 95215, then if you find a home that interests you, just give us a call and we can arrange a showing.